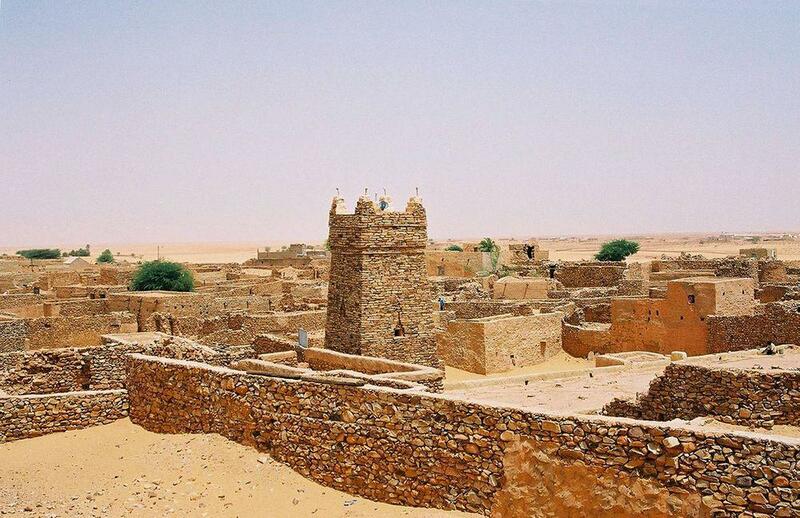 Below are listed the most amazing natural and man made landmarks of Mauritania. Aicha monolith – Adrar. Giant natural monolith – pyramidal, dark grey mountain, rising from the desert. Ben Amera (Ben Amira) – Adrar. One of the largest monoliths in the world, 400 m high, dark grey pyramid rising from the desert sands. Prehistoric rock art is found nearby. Kediet ej Jill – Tiris Zemmour. Large mountain, tallest peak in Mauritania. Whole mountain consists of magnetite and has bluish color. Area has strong magnetic field. Maghrouga cliff formations – Hodh El Gharbi. Amazing monolith with several great natural arches. 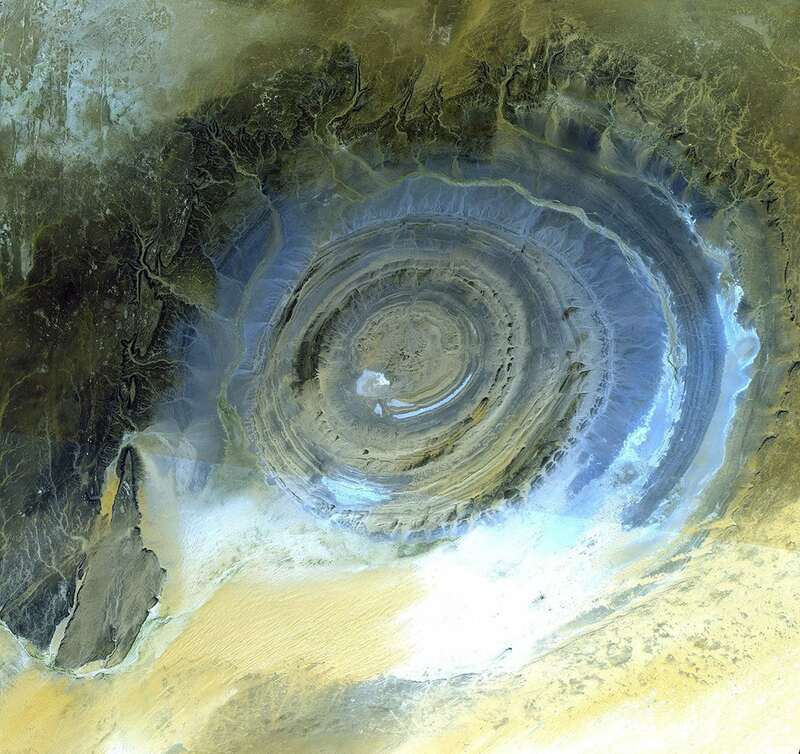 Richat Structure – Adrar. Amazing geological formation – heavily eroded, approximately 40 km wide dome, which looks like a giant eye from the space. Although widely believed to be an impact crater, this is enormoys, circular upheaval dome. 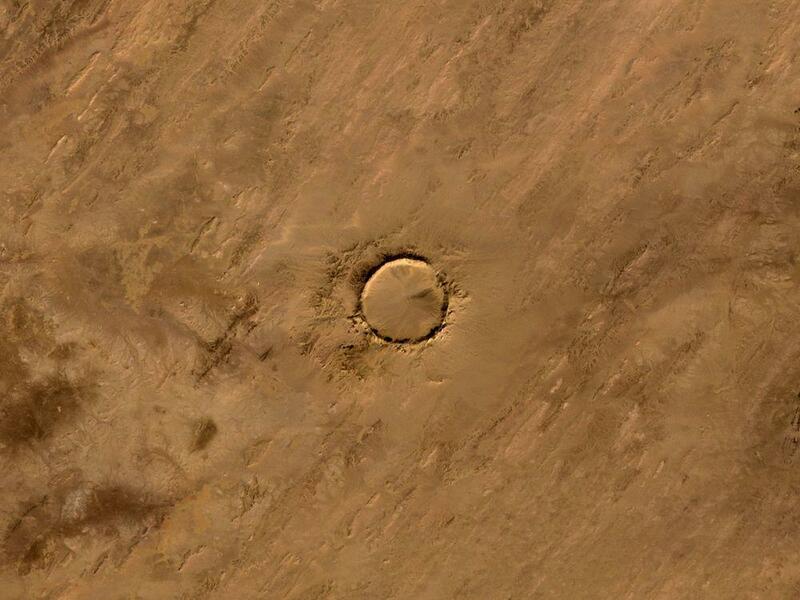 Aouelloul crater – Adrar. Well preserved impact crater. Formed approximately 3.1 million years ago (Pliocene). Diameter 390 m.
Fer de Dieu (Chinguetti meteorite) – Adrar. Legendary meteorite with impact crater. Although several Europeans claim, that locals have been guiding them towards a large iron mountain (40 m high and 100 m long) or seen semi-circular crater, this meteorite has not been located by scientists thus far. In this area are found interesting tectites, including large glass balls. Temimichât-Ghallaman crater – F’dérik. Possible impact crater with well visible circular crater rims. Geological origin is not clear. Tenoumer crater – Tiris Zemmour. Well visible, interesting impact crater. Diameter – 1.9 km, depth 110 m, age – approximately 21,400 years. There are numerous periodic waterfalls with impressive, vertical plunges, some more than 150 m tall. Hartéga Guelta waterfall – Tagant. More than 10 m tall, periodic waterfall. Cabo Blanco seal colony – Dakhlet Nouadhibou, Cabo Blanco peninsula, partly in Western Sahara. The only colony of monk seals in the world. Here in caves lives a group of extremely rare Mediterranean monk seals (Monachus monachus), here could be living some 200 seals. Hartéga Guelta dwarf crocodiles and other dwarf crocodiles of Tagant plateau – Tagant. In small, perennial lakes of the dry Tagant plateau has survived dwarfed population of desert crocodiles (Crocodylus suchus). These crocodiles are not more than 2 – 3 m long and can survive the dry period by estivating in caves or even burrowing in the sand. Amogjar rock art – Adrar. Eight groups of rock art of high quality, most pictures show cattle. Oldest art is from the Neolithic Age, newer drawings show horses as well. Dhar Tichitt – Tagant. Interesting prehistoric site with complex system of stone walls and rich finds of rock art. 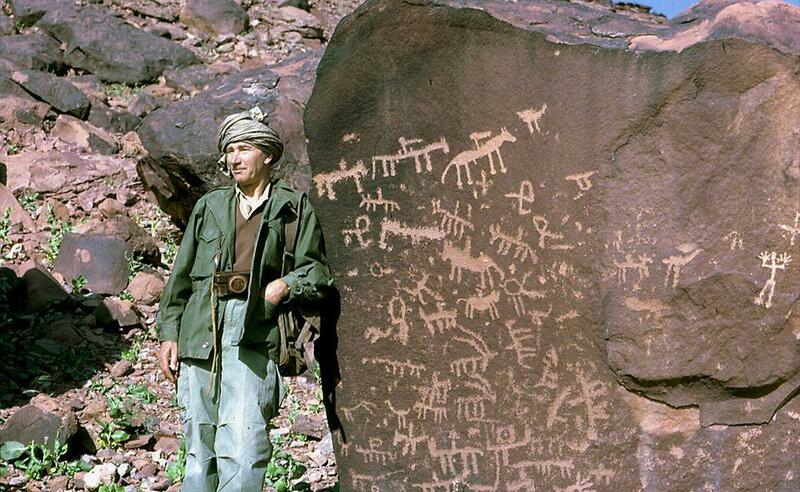 El Rhallouiya rock art – Adrar. Site with rock engravings from three time periods. Most ancient are from 2000 – 500 BC (wild fauna), second period is approximately from 500 BC to 0 AD (shows also cattle and carts). Engravings from around 0 AD include also some Lybico-Berber writings. Guilemsi rock art – Tagant. Sandstone ridge with several shelters, contains valuable rock art and prehistoric stone enclosures, presumably 3 – 4 thousand years old. M’treoka rock art – Hodh El Gharbi. Unusual prehistoric rock art, which resembles some type of proto-writing. Taoujafet rock art – Adrar. Site with exquisite prehistoric rock art. Tensès rock art – Adrar. Naturalistic rock art of good quality, depicting humans, wild animals, cattle. Atar stone circles – Adrar. Several Neolithic stone circles, well preserved in desolate desert environment. Azougui – Adrar. Abandoned desert town, important centre in the 11th century. Almoravids built here large fortress surrounded by large plantings of palms. Rock carvings from the 7th century AD have been found at the city. Preserved parts of citadel, necropolis. Chinguetti – Adrar. Historical desert town, medieval trading centre. Founded in the 12th – 13th century next to an older village. City is partly abandoned, but still provides striking urban landscape, here in five libraries are located valuable manuscripts. Koumbi Saleh – Hodh Ech Chargui. Ruins of medieval city, possible capital of Ghana Empire. This large Muslim city was inhabited in the late 9th – 14th centuries. Now approximately 15 m tall mound remains in the place, where some 15 – 20 thousand people lived. Ksar el Barka – Tagant. Remote desert village, established in 1690. Village has typical vernacular architecture – dry stone walls and often – columns. 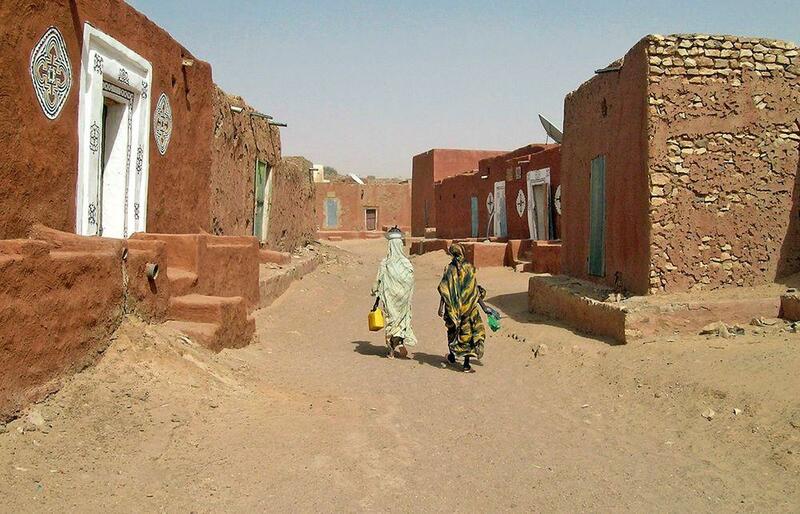 Ouadane – Adrar. Ruins of historical desert town – staging post for caravans. Could be established in the 12th century, city walls built in the Middle Ages. Prospered in the 14th – 18th centuries. Oualata – Hodh Ech Chargui. Small, old desert town, most likely established in the 5th century AD. The adobe houses in the village are highly decorative, with ornamented paintings. Tegdaoust – Hodh El Gharbi. Ancient city on the mound, area 12 ha. 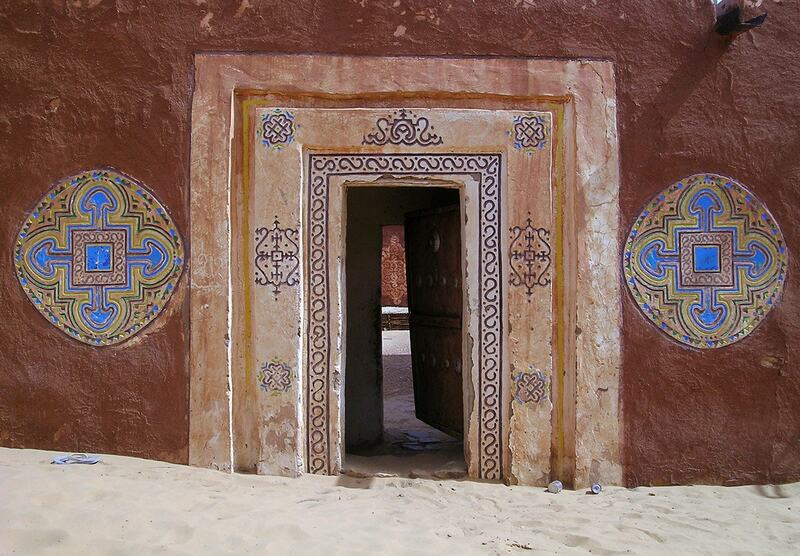 This desert city flourished in the 7th – 10th century, was abandoned by the 13th century. Tichit (Tichitt) – Tagant. Very old desert town, almost abandoned. Already in the 11th century it was one of major centres in this region, flourished until the 19th century. Contains valuable buildings in vernacular style. Boutilimit library – Trarza. This library contains a collection of unique manuscripts, established in the early 19th century. Chinguetti Mosque – Adrar. Ancient mosque, built around the 13th – 14th century. Minaret of this mosque could be the second oldest minaret in the world. Kaédi Regional Hospital – Gorgol. Hospital building with amazing, innovative architecture, uniting traditional and modern styles. Constructed in 1989. Nouadhibou port – Dakhlet Nouadhibou. World’s largest ship graveyard, with more than 300 rusting ships in the port. When Peter Hudson set off for Mauritania, he knew it only as a big blank space on a map of Africa. Travelling from the capital, Nouakchott, hardly more than a desert encampment, he found among the oases and ancient caravan towns a people in harmony with their harsh surroundings, and began to understand something of the emerging nation’s confrontation with the This book describes Hudson’s travels as he progressed by foot, canal and donkey. Nina Sovich had always yearned for adventures in faraway places; she imagined herself leading the life of a solitary traveler. Yet at the age of thirty-four, she found herself married and contemplating motherhood. Catching her reflection in a window spotted with Paris rain, she no longer saw the fearless woman who spent her youth travelling in Cairo, Lahore, and the West Bank staring back at her.